Is your heart ready for what you’ve been waiting for? Isn’t it funny how when we share our dreams with others, they always seem to ask, “Well, what are you waiting for?” Today I’d like to ask you a much more difficult question. How are you waiting for it? Too many times I see people discouraged and angry with God for not granting His promise when THEY feel is the right time. But, what if God is ready to give you His promise, and it’s actually you who isn’t? Is your heart really prepared for what you’ve been waiting for? Oh. That’s when it hit me, there I was so desperate for the “more” that God has for my life, just wallowing in my own self-pity wondering WHEN I was going to have that life God promised, WHEN was he going to make my dreams come true, the dreams HE gave me? I was so mad at God for giving me hope, for showing me a future that He had for me, but not giving it to me. That small sentence hit home. It’s not God who doesn’t want abundantly more for me, in fact, it was me. Like my friend Kelly said last week, “time is a tool,“ am I going to pick it up and use it wisely, or lay it down and waste it? I was brought to my knees in tears reading that sentence. Thinking of all the time I wasted complaining to God, time I could have been using to prepare my heart, time to be humble and grateful for all the blessings He’s poured out over me. So I’m asking you how are you waiting? But even more I’m asking myself how am I waiting? Am I being diligent to read God’s word, to tune into His voice? Am I grateful for all he’s given me? Because if I’m not, why in the world would he just hand out more? I find that God often speaks very loudly to us in troubling times if we would only tune in. It wasn’t the exact answer I was looking for, it wasn’t a door I was expecting to fly open. But it was Jesus, meeting me where I was. 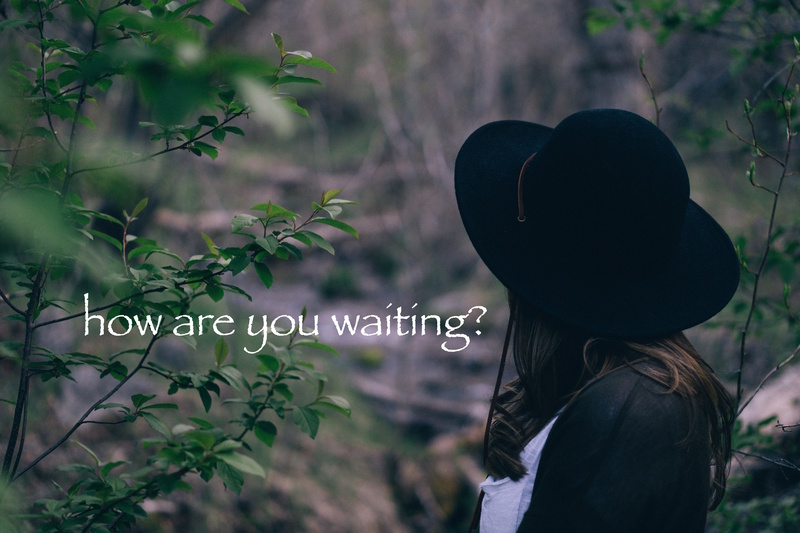 Sometimes that’s what we need during the wait, we need to invite Jesus to meet us where we are, to show us how to wait, and to ready our hearts. If I were to give you a brand new car, of course you’d be excited! But let’s say its a manual transmission, and you have absolutely no idea how to drive it, and no one to show you. Well, it wouldn’t be much of an exciting gift now would it? You need someone to help you use it, to show you the ropes so you can get from point A to point B without causing any damage to you, or those around you. This is how we should be waiting, we should be waiting in anticipation for what we’re asking. We should be waiting in preparation, we should be diligent to understand the responsibility we have for the gift God is eager to give us. God is ready to give us our hopes and dreams, it’s really us who has to step out in faith and ask Jesus to meet us in that car, or in our jobs, and equip us with the tools to get where he wants us to go. I’ll ask once more… how are you waiting? Arrianna is a happy-go-lucky young lady who enjoys beauty, fashion, and spreading the love of Jesus through: Small Groups, YouTube, and Blogging. Her dream is to one day be a wife, mother and friend – but most importantly a world changer for the kingdom of God. For more about Arri CLICK HERE. < Previous To Be or Not To Be Satisfied? That is the question.